With the successful completion of the presidential and national assembly elections, the stage is now set for the governorship and state assembly polls, where the Enugu State governor and gubernatorial candidate of the Peoples Democratic Party (PDP), Rt. Hon. Ifeanyi Ugwuanyi is poised to clinch a landslide victory. The outcome of the national assembly election in Enugu State was overwhelming as the candidates of the PDP swept all the positions. This feat was indeed a reaffirmation of the party’s strength in the state as well as the governor’s swelling popularity and acceptance by the people. It goes a long way to predict the outcome of the March 9 governorship and state assembly elections in the state. It is on record that Enugu State since 1999 has remained a PDP state, with its candidates occupying all elective positions, ranging from the National Assembly, State Assembly, Council Chairmanship and Councillorship, despite the fact that the party lost power at the national level in 2015. Today, the party through Ugwuanyi’s peace and good governance initiatives, uncommon leadership style and absolute faith in God, who he gives all glory, honour and adoration, having entrusted Enugu State to His hands, has continued to enjoy the tremendous goodwill, solidarity and support of the people. As a true man of the people with track record of inestimable humility, vision, simplicity and candor, Ugwuanyi has established a closer relationship with the masses and united political, religious and traditional leaders borne out of his firm belief in the unity, peace and progress of Enugu State. 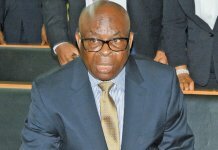 The governor’s ability to manage issues of divergent interests and accord everybody their due respect irrespective of class, religion, ethnicity or political affiliation is outstanding and has contributed immensely to the success story of his administration, which came on board when the nation’s economy was in recession. His administration’s ideology, which centres on peace and grassroots development initiatives was carefully conceived to promote rapid development, alleviate the suffering of the people, give the neglected a sense of belonging and open up new areas for socio-economic expansion. The sound vision has stood the governor out as a great achiever and grassroots leader. For instance, out of the over 450 kilometers of roads executed in the past three and half years by his administration, rural communities have the lion share against the urban centres. Today, there are avalanches of signature projects registered across the length and breadth of the state that positively impact the lives of the residents, such as the historic and undulating Milliken Hill road, Ngwo, Enugu and the Opi-Nsukka dual carriageway in the University town of Nsukka. Communities that were hitherto neglected had been remembered with one legacy project or the other through the rural development programmes of the government such as the “one community one project” initiative. Workers’ salaries are paid on the 23rd of every month even without receipt of the federal allocation or when the date falls on a Saturday or Sunday. The state government also pays the 13th month salary as Christmas bonus. The state pensioners who receive their pensions as and when due, recently paid the people’s governor a symbolic Thank-you visit for payment of arrears of gratuities owed them from January 2009, from the monthly N100 million approved by his administration for the said purpose. The education sector has received priority attention as over 589 primary and secondary school blocks, have been constructed, renovated and equipped with ICT facilities while more than 4000 teachers were recruited to improve the standard of learning in the state. In the health sector, besides completion of the state-of-the-art Enugu State Medical Diagnostic Centre, Enugu and construction of District Hospitals across the state, the positive impacts of the state’s primary healthcare programme in the rural communities through Free Maternal and Child Healthcare and the integration of Faith-Based Organizations have strengthened delivery of medical services to the grassroots. On empowerment, 3400 traders have so far benefited from the first and second phase of the Enugu State Traders Empowerment Scheme while 1000 youths (now increased to 2000) were usefully engaged to clean up the state under the Enugu Clean Team Project. As scholarships were offered to 680 indigent engineering students of the Institute of Management and Technology (IMT), Enugu and Enugu State Polytechnic Iwollo, Ezeagu LGA, to promote the harnessing of the beneficiaries’ potentials for knowledge transfer, economic growth and self-reliance, 750 unemployed youths were trained and assisted with finance to establish their various businesses of practice, under the Sustainable Development Goals (SDGs) Skill Acquisition Programme of the state government. 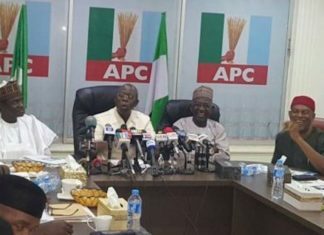 The prevailing peace and security in Enugu State have encouraged foreign and local direct investment and earned the state the enviable status as one of the most peaceful and safest states in the country – a fact the INEC accredited observers for the February 23 Presidential and National Assembly Elections confirmed. Consequently, Enugu State was recently rated by the World Bank Group as the second most advanced state in Nigeria towards the frontier of global good practices with regards to Ease of Doing Business. The state under Uguwanyi’s watch has received other avalanches of outstanding ratings and commendations. 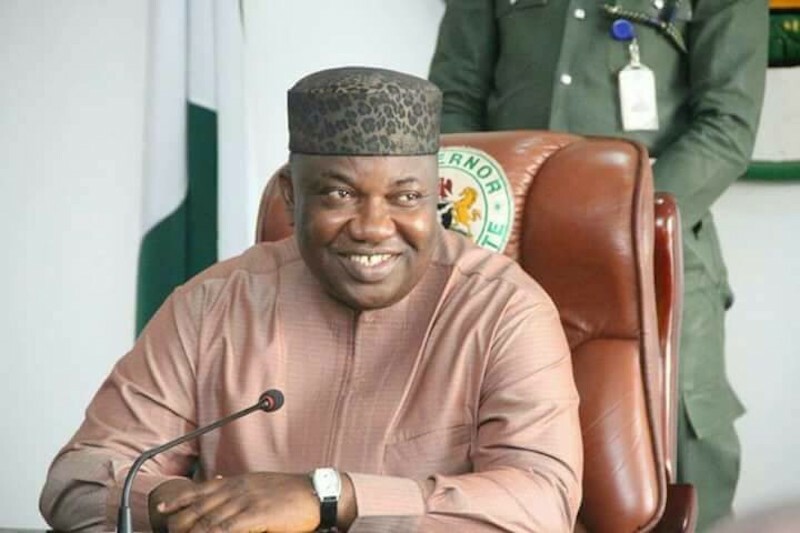 These landmark feats, which are the hallmark of good governance include, the Senate Committee on State and Local Government Administration’s verdict, which named Ugwuanyi as the best governor in judicious utilization of the bailout funds; the recent Economic Confidential magazine verdict that listed Enugu among the seven states that are solvent with impressive over 30 percent Internally Generated Revenue (IGR) to fund additional economic activities; the BudgIT report, which listed Enugu, Lagos and Rivers as the only three states out of the 36 states of the federation that have fulfilled obligations to their workers, among numerous others. 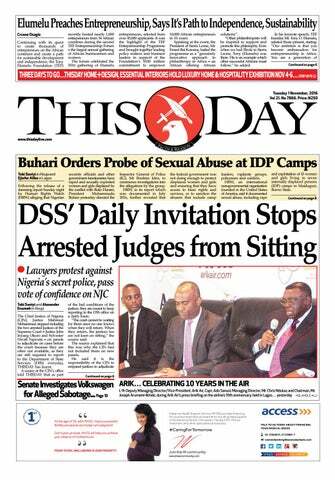 In recognition of all these milestone achievements, four leading national dailies – The Sun, Vanguard, Leadership and Independent Newspapers – this year honoured Ugwuanyi as their Governor of the Year 2018, a feat that is unprecedented in the nation’s history. All these landmark achievements and others too numerous to mention, have indeed earned Gov. Ugwuanyi a gale of endorsements for his re-election by virtually all spheres of the society, including non-indigenes. For instance, while Rev. Fr. Ejike Mbaka of the Adoration Ministry Enugu Nigeria (AMEN) and Archbishop Emmanuel Chukwuma of Enugu Ecclesiastical Province (Anglican Communion) have endorsed Gov. Ugwuanyi’s re-election declaring that there is “No Vacancy in the Lion Building in 2019”, the Prelate of the Methodist Church of Nigeria, His Eminence, Dr. Samuel’ Emeka Kanu Uche, described the governor’s second term bid as “sacrosanct”. Remarkably, all the traditional rulers in Enugu State, for the first time in the history of the state, gathered and unanimously endorsed the people’s governor for a second term and presented him with an “Ofo’ as a symbol of authority for their support and endorsement. 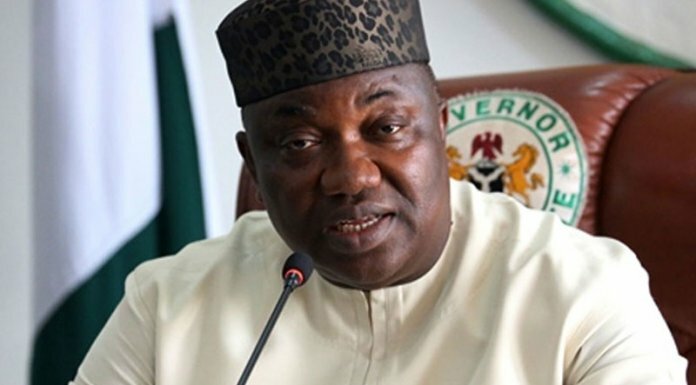 The traders, civil servants/organized labour, pensioners, political leaders, students, youths, artisans, academics, non-indigenes, and over 450 support groups, among others are also in the list of mature, revered and independent-minded stakeholders that have unanimously endorsed Ugwuanyi’s re-election. Recently, the coalition of governorship candidates of different political parties in Enugu State unanimously endorsed Gov. Ugwuanyi for re-election “to complete the good work you have started in our state”. 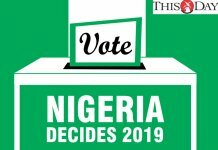 The candidates totaling 26 in number, through their Co-ordinator, Dr. Vicgenial C. Odumejemba of the National Conscience Party (NCP), said the endorsement was in recognition of the “sustainable security and peace in the state”. The governorship candidates added that it was because of the governor’s “humane and down to earth dealings with issues without discrimination” and “prudent spending and refusal to embark on unnecessary loans as an economic expert and debt manager”. 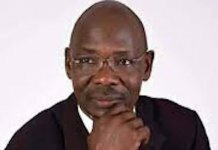 They therefore, pledged to mobilize their teeming supporters to vote massively for Gov. Ugwuanyi, stressing that the governor has been “carrying along all political parties in the state and running an all-inclusive government”. Besides all these, Gov. Ugwuanyi has remained committed to a vigorous door-to-door campaign at market places, communities and streets of the state, canvassing for votes and establishing a direct contact with the people, urging them to come out en masse and vote for him and other candidates of the PDP in the state. From the foregoing, it is therefore, an undisputable fact that Ugwuanyi is the candidate to beat in the forthcoming governorship election in Enugu State – signposting that the wind of victory is around the corner and March 9 elections will surely end in praise in the state. Let’s make it happen again, for Enugu State is truly in the Hands of God!